Update July 22 2008: This contest is closed. I'll select a winner later today! 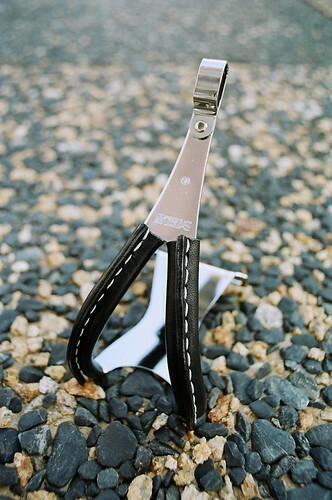 I have a leather toe clip sewing clip to give away. It's a kit with two strips of leather, some string, a needle and instructions to customize the look of your MKS toe clips. Akihiro aka "swamp" in Japan creates these kits for sale in Japan for fixed gear cyclists. Read more about this kind of leathercraft (in Japanese) here and here. Contest details are below. My great-great-dot.dot.dot-great paternal grandmother was a Mississippi Choctaw who walked the Trail of Tears to "Indian Territory" in the mid 19th century. Most of my family on my dad's family have Bureau of Indian Affairs "Indian Cards" that qualify them to receive huge chunks of cheese for free. My great-great-dot.dot.dot-great maternal grandfather was some semi-famous shogun in northern Japan who killed a lot of people with his sword. I show the same samurai spirit by relentlessly pursuing arcane bike facts across the blogosophere. Banzai! I was born overseas at a former U.S. military base that is now Showa Kinen Park at Tachikawa, Japan. The park was established to commemorate the 50th Anniversary of the late Emperor Showa's reign. "Showa" is Hirohito's "death name" or the name by which Hirohito is known after his death. The current Emperor of Japan, Akihito, has the death name "Heisei." This name is also used for the Japanese official calendar. Since this is the 20th year of Akihito's reign, this is the year Heisei 20 or 平成 20 if you have Japanese fonts installed. I'm a graduate of the U.S. Department of Defense Dependent Schools system. The U.S. Department of Defense operates schools for military dependents who live overseas. We're called military brats. Instruction is in English with (mostly) American school teachers. Expatriots who couldn't afford to pay tuition at the International schools could also send their children to DoDDS schools; they still paid tuition but it was cheaper than places like the American School in Japan (ASIJ). My classmate Sara Kaalkinen, for example, was the daughter of a Lutheran missionary to Japan from Finland (if I recall). We flew on military airplanes for band trips, debate contests and sports events at other military schools. I or my classmates, for example, flew on C-130 and C-141 transport aircraft from Tokyo to Okinawa, Korea, and the Philipines to compete with other schools. Part of my college tuition was paid for with an athletic scholarship. I ran cross country for Midwestern State University in Wichita Falls, Texas. MSU started a collegiate cycling team the year before I left in 1989, and they now have one of the strongest cycling programs in the nation. This year my wife and I will have been married 18 years. She's currently attending Bethany University in Santa Cruz working on her Master of Science degree in Clinical Psychology. She's interning at a rehab center counseling drug addicts. If you have a blog or other website, link to this post and write at least one thing about yourself. Optionally tag somebody else. If you're not sure trackbacks work properly, be sure to leave a comment here also with a link to your post. If you don't have a blog or website, feel free to write one thing about yourself in the comments to this post. Optionally tag another person. On July 22 (next Tuesday) morning at about 8 AM Pacific Time, I will randomly select a winner from among the entries. Contest open only to residents of the United States and Canada. It's up to you to figure out if you owe taxes or if this contest is legal in your area. If you're in the habit of commenting anonymously, you'll need to figure out a way to uniquely identify your comment. BGW and Jack in St. Louis, for example, I already know how to ID. If technical issues keep you from posting the winning entry, too bad so sad. I'm the final judge on who the winner is. If you win, you agree to have your name or your Internet blogging "handle" or nickname posted as the winner. Done, but not sure if it tracked back properly. No blog so here is my comment. I used to ride my bike everywhere when I was < 18. Hundreds of miles a summer because there was nothing else to do. Then I stopped riding for almost 20 years. I started up again because the Podiatrist said I shouldn't run anymore. Now I commute a few times a week by bike. When I was 12 years old I rode my mountain bike around Lake Tahoe, doing 55 miles in one stretch. While I've ridden for pleasure and commuting lots since then, I didn't do another ride of at least 55 miles until I was 25.